A few quick thoughts on the 2014 Brilliant Mistake Cabernet Sauvignon from Napa Valley. Brilliant Mistake was founded in 2013 by John and Stacy Reinert with Rebekah Wineburg making the inaugural vintage, sourcing Cabernet Sauvignon from vineyards in Rutherford and the Stags Leap District. With a background that included stints at Tenuta dell’Ornellaia, Staglin, Rudd and Buccella, Wineburg finished the 2013 vintage before returning to Buccella and later moving on to Quintessa. She was succeeded at Brilliant Mistake by Maayan Koschitzky, a protege of Philippe Melka. An Israeli native, Koschitzky started in the wine industry with Margalit Winery in Galilee before moving to Napa Valley in 2011 to work at Screaming Eagle and then Dalle Valle. 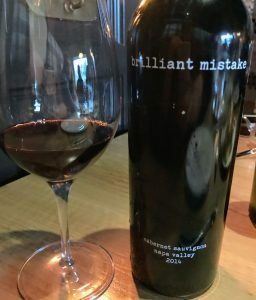 At this year’s Premiere Napa Valley, Brilliant Mistake was one of the top selling lots at the auction joining the likes of Chappellet, Shafer Vineyards and Ovid to help raise more than $4.1 million for charity. Rich dark fruit like plums characterize this Napa Cab. Medium-plus intensity nose. 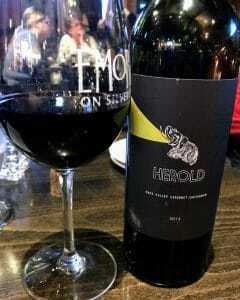 Very rich dark fruit–black plums, blackberry and noticeable oak spice. On the palate, those rich dark fruits carry through. However, I was pleasantly surprised at how well balanced the richness was with the medium-plus acidity. The noticeable oak spices of clove, cinnamon and allspice are also present. But the oak is well-balanced with the sweet vanilla playing a supporting role in rounding out the high tannins. Very full bodied and seductive mouthfeel with a long, minute-plus finish that lingers on the juicy black fruits. This is your classic, hedonistic Napa Cabernet Sauvignon but an exceptionally well made one. It seduces you with the bold, rich dark fruits. But it certainly toes the line with enough acidity and structure to keep it from being sweet and one dimensional. While it’s drinking absolutely scrumptious now, I’m skeptical at how much better it will get with bottle age over the next 5-10 years. Compared to its Napa peers, the wine is well priced at $150-175 a bottle. However, I can see this wine eclipsing the $200 mark soon enough. Tagged Brilliant Mistake, Buccella, Cabernet Sauvignon, Chappellet, Galilee, Maayan Koschitzky, Margalit Winery, Ovid, Philippe Melka, Premiere Napa Valley, Quintessa, Rebekah Wineburg, Rudd, Rutherford, Screaming Eagle. Dalle Valle, Shafer Vineyards, Staglin, Stags Leap District, Tenuta dell’Ornellaia.